Here and Now and Then was like watching Doctor Who for the first time. There’s that science fiction wonder, those emotions, and awe all at once. Here and Now and Then is one of those books that is instantly endearing. It has themes of family, agency, and love all wrapped in a science fiction story that will have your heart throbbing. There’s drama, love lost, and forgiveness all in one. It’s one of those books where all these elements come together in perfect harmony to make a book that just clicks with you without effort. If you love Doctor Who this book is a must read for you. Reading it felt like being drawn into Doctor Who for the first time. I first saw the episode with Vincent Van Gogh. And just like Here and Now and Then there’s this tenderness, this wonder, and utter emotion that spills forth. And I fell in love with this book only more and more until the end left me ugly crying on my couch. Here and Now and Then is subtle and tender. It has references and brilliant plots that will make you stare in awe and smile. There’s a playfulness to the story, to the characters, all while being utterly heart warming. From the very beginning there are secrets simmering beneath the surface and you have to wonder if this volcano of a story is active or dormant. Is this a moment of calm before the storm? One of the biggest themes that I adored was the question of if we can let go of our past. All of the characters struggle with this theme in various ways. Whether it’s unanswered questions about our parents, closure at the end of a relationship, or the possibility of never having answers. We sometimes have to realize that we can never say everything we want to. To accept what we had as what we had. And with time travel, that’s a bitter pill to swallow. Because you always think you can go back , can answer another question, can right another wrong. Finding closure with a time machine always seems like an unanswered question, a never ending ellipses. And how do we remember a life of declarative statements and open brackets? When do we decide we can let go of the past? And what will we do to keep it? In many ways it’s a book about time travel that acknowledges the fact that time runs out. You can keep chasing the sun, but it sets on all of us. And when we are faced with those last rays of light, what will we do with our actions? Our choices? Our sacrifices? Another big theme is the protection of our loved ones. And Kin is not short of loved ones who he wants to protect. But how do we really protect those we love? Because there comes a time when we have to let them fly. To soar off into the distance, acknowledging that we cannot protect them forever. And when do we realize that our feeble attempts at protection are merely tethering them to the ground? 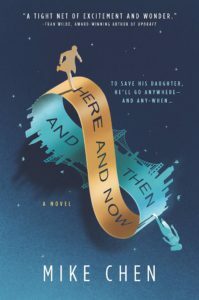 Until the end, Here and Now and Then feels like the entire book will upend you. The tension and the action, the emotions, it all hooks you further and further. It’s full of science, time traveling conundrums, and SF references. For those who love Doctor Who and Star Trek, this is your dream incarnate. The writing is cunning, compelling, and charismatic. Find Here and Now and Then on Goodreads, Amazon, Indiebound & The Book Depository.